The city of Brookings was surveyed and platted in preparation for the railroad’s construction into the territory in 1879. Prior to Brookings’ “official beginnings,” the area had been inhabited by Native Americans. Named after Wilmot W. Brookings, a spirited pioneer who traveled to the unsettled Dakota Territory in the late 1850s, Brookings soon grew into a booming town. Merchants from the surrounding areas packed up their businesses and moved to Brookings looking for great opportunity. In 1881 Brookings was chosen as the site for South Dakota State College, a land grant university. South Dakota State College became South Dakota State University and is now the state’s largest Division I university. Both the city and university have grown dramatically and continue to thrive in the 21st century. Today, businesses are still packing up and moving to Brookings! With a vibrant community and dedicated workforce, Brookings continues to recruit industry and attract new retail businesses and restaurants. 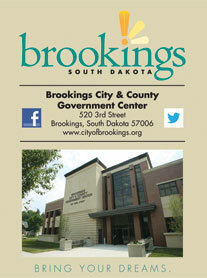 Brookings is a hub for spirited entrepreneurs and community-minded individuals!